With the InnoSlab-laser operated at frequency of 50 kHz, a volume ablation rate of more than 1 mm³/sec can be achieved. Wafers with more than 1000 holes with tapered cross section can easily be produced. The thickness of the glass wafer in this case was is 2mm, the processing time per hole is 5sec. Full body cutting of glass sheet for touch screen displays and 3D cutting of glass condensers for concentrating solar cells can be realized using the layer by layer ablation process. In case of touch screen display the thickness of the glass is 0.7mm. The maximum cutting speed achieved amounts 10mm/sec. In the past laser-machining of glass was mostly limited to far-infrared or ultra-violet lasers. This is due to the fact, that glass absorbs laser radiation only in these wavelengths regimes (ref. picture below). 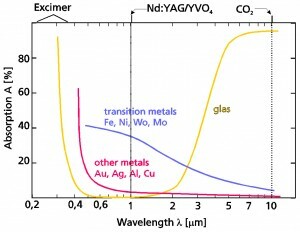 At the wavelengths of solid state laser around 1µm and its second harmonic glass is highly transparent and merely a small fraction of the laser power is transformed into thermal energy. If the laser however is focussed to a very small spot and if the laser is emitting very short and intensive pulses, a very high intensity is achieved in the focal spot, exceeding the threshold intensity Is shown in the figure below. Above this threshold intensity an electron avalanche is created, starting form a couple of free charge carriers, being always present. Due to the strongly increased charge carrier density the absorption coefficient for electromagnetic radiation abruptly increases to values of several 10 % and the laser power, thus being absorbed, leads to melting and evaporation of a small amount of material. It is specific for this process that the interaction between laser and material is localised to the focal point of the laser beam, the material below and above is not affected at all by the laser. The threshold intensity Is for this non-linear process is considerably high: it is in the range of 109 to 1010 W/cm2. Such intensities can be achieved, if two conditions are met: on the one hand a laser is required, providing a high beam quality, which means that the beam can be focused down to a very small spot size and on the other hand the laser has to be operated with pulses of very high peak power. Diode-pumped, q-switched solid-state lasers combining both properties, such as the Innoslab-laaser are commercially available since some years. 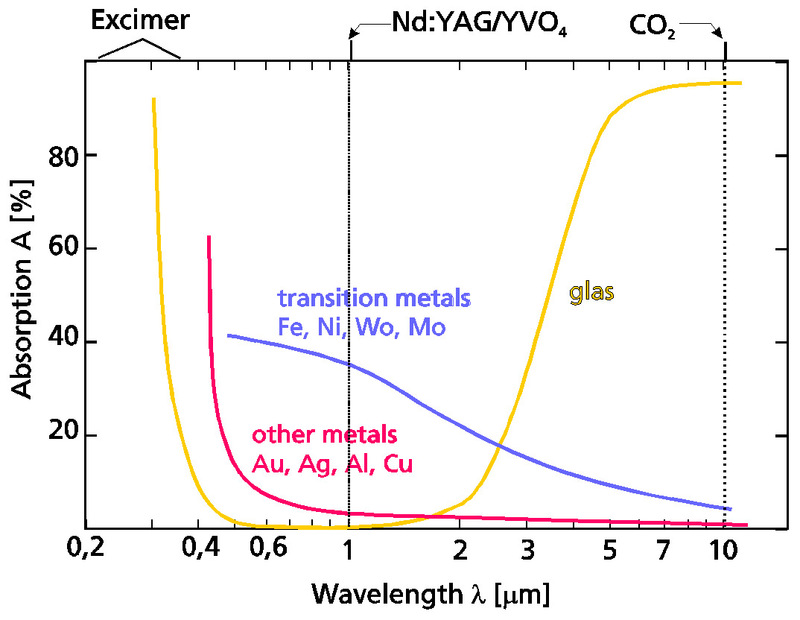 Common types are the Nd:YVO4– and the Nd:YVO4-laser.